I was thrill to read the immediate respond by the Canadian government, the Opposition Party and even the Green Party condemning the Burmese military charges against Burma’s pro-democracy icon Aung San Suu Kyi after May 5th accident. From White House to Thai parliament, the Ottawa Citizen to Irrawaddy News, Burma issue was on the front page and became the hot topic again. I thank them for their interest of Burma Issue. But apart from what was happening with Aung San Suu Kyi’s trail in Burma, I wonder if they know about what have happening in the other parts of the country (Burma) now. Daily repression and widespread abuses against villagers in Burma's ethnic-minority areas continue. The international community and Canadian government are quiet. I wonder if they haven’t read the news, no one has briefing them what is happening now or they keep quiet because they thought the attacks are not as important as the trail of ASSK. Are they not as important as human being like you and me??? I wonder!! But while Suu Kyi has deservedly received a great deal of international attention over the past two decades, Myanmar’s ethnic minorities — more than one-third of the population — have suffered without international outcry. For Myanmar’s process of national reconciliation to be successful, the plight of the minorities must also be addressed. 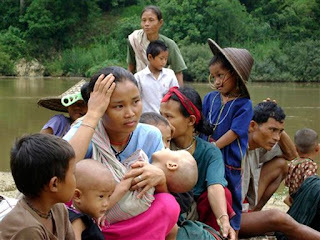 The Karen Human Rights Group states the same thing about what is happening now in rural Burma. Thousands of civilians in Ler Per Her, an internally displaced refugee camp inside Burma in Karen State, fled across Thai border a few days ago because the Burmese Army moved in to the area. In January this year, I had visited Ler Per Her and another IDP camp on my fact finding trip. I had celebrated Christmas and New Year with them. I had met with orphaned children, sick elderly and newly born babies and I wonder where they are now. I look back the photos that I took when I was there and I thought are they still survived because they couldn’t bring anything when they fled into Thailand. And it is raining season now in Thailand and Burma. Can you do something Canada? Please, I need your attention. Please come back for update of the photos that I took while I was in the Ler Per Her camp. You will be amazed to see them.